Lt. Gen. DT Thompson: “We have companies with some great ideas who have advanced to some level or are looking to advance in the future." WASHINGTON — The Air Force is counting on private space companies to build rockets that can lift military and intelligence agency satellites into orbit. Despite recent reports of layoffs at launch companies, the vice chief of Air Force Space Command said the military is confident that the commercial space industry will thrive. Lt. Gen. David “DT” Thompson said the United States is on the verge of a boom in commercial space, although the health of the industry is “always a little bit of a concern,” he told reporters on Friday after a Mitchell Institute event on Capitol Hill. The Air Force years ago decided it will no longer develop its own rockets and instead competitively procure launch services from commercial vendors. Officials recognize that the success of this approach is largely dependent on market forces, and whether there will be at least two strong financially healthy companies to compete for national security launches. Air Force Space Command will be closely monitoring the progress of three cost-sharing research-and-development contracts awarded in October to United Launch Alliance, Blue Origin and Northrop Grumman Innovation Systems. The three companies collectively received $2.3 billion in Air Force funding to make sure their domestically produced commercial rockets can meet national security launch requirements. Today, only ULA and SpaceX rockets are certified to carry national security payloads. Both companies compete under the Evolved Expendable Launch Vehicle program. The EELV program is being renamed National Security Space Launch Program. As the Air Force moves beyond EELV, said Thompson, “The first thing we need to understand is what is the capability, how reliable is it, how much how can we count on it?” Another priority is making sure the Air Force has a domestically produced rocket to replace ULA’s Atlas 5. Congress in the 2015 National Defense Authorization Act prohibited the Defense Department from awarding or renewing EELV contracts after 2022 for rockets that use Russian engines. The Atlas 5 uses the Russian-built RD-180 engine for its main stage. “We’re still in this phase where we need to get off the RD-180 to fully American rockets,” said Thompson. The Air Force expects to be able to certify new commercial rockets over the next two to three years that will compete for launch contracts. Meanwhile it is also keeping an eye on the commercial launch demand, which will be essential for companies to be able to offer competitive pricing for military launches. In the mid-1990s, the Air Force set up the EELV program with two companies — McDonnell Douglas (later acquired by Boeing) and Lockheed Martin — that would compete for government and commercial business. But the commercial demand dried up in the early 2000s and the Air Force decided in 2005 to forgo competition and split military launch awards between Boeing and Lockheed Martin. The companies later made the case that they should merge their launch operations and created ULA as a joint venture that operated as a monopoly from 2006 until 2015 when SpaceX entered the national security market. 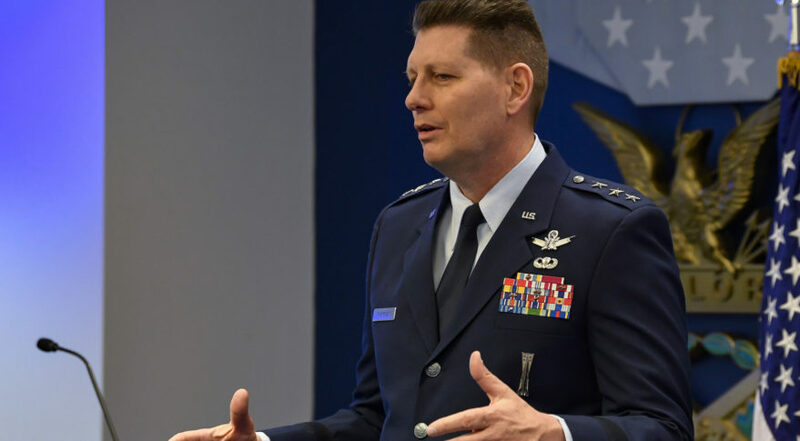 In remarks at the Mitchell Institute event, Thompson said Air Force Space Command in 2018 supported 33 satellite launches: nine military, five civil and 19 commercial, including 13 booster landings by SpaceX. The 45th Space Wing at Cape Canaveral Air Force Station, Florida, supported 20 launches and 10 landings. The 30th Space Wing at Vandenberg Air Force Base, California, had 13 launches and three landings.